ATSC Digital Terrestrial TV Transmitter is a standard developed by the Advanced Television Systems Committee, Inc. for terrestrial digital television broadcasting. ATSC is an international, non-profit organization developing voluntary standards for digital television. ATSC Digital TV Standards include digital high definition television (HDTV), standard definition television (SDTV), data broadcasting, multichannel surround-sound audio, and satellite direct-to-home broadcasting. ATSC Digital Terrestrial TV Transmitter is widely adopted in North America for 6 MHz terrestrial channels with a bitrate for the transmitted signal of 19.3 Mbit/sec. This standard is based on 8-VSB (Vestigial Sideband) modulation with pilot. The input video stream for the modulator is a set of 188-byte standard MPEG-2 data packets. There are two stages of FEC (forward error correction): Reed-Solomon encoding and Trellis encoding. The sequence of MPEG-2 data packets are encoded in Reed Solomon. The encoder adds 20 parity bytes for each data packet. Next, the data is sent through an interleaver to be robust against bursts of impulse noise and encoded using a Trellis encoder to form the transmission data. Each transmission data frame consists of two fields, and each field consists of 313 data segments. 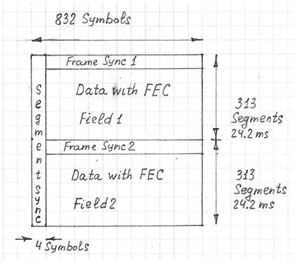 The first segment of each field is a frame synchronization segment. Each segment consists of 832 one dimensional 8-level symbols. Each segment has a 4-symbol synchronizing signal that takes only two levels out of 8. The symbol rate for all digital VSB modes is 10.762 Msb/s. The sequence of symbols are modulated in the VSB modulator to form an 8-VSB signal. After that the signal is moved in the spectral domain to RF band and then broadcast.